Kahal Kadosh Beth Elohim provides a variety of options for study and growth for adults and young people alike. Our B'nei Mitzvah coordinator and our Rabbis work extensively with each young person and with his/her family to maximize the experience, value and success of this major life-cycle event. Each Bar/Bat Mitzvah candidate must be a student in good standing in our Religious School, commit to completing his/her Jewish studies through the tenth grade (Confirmation), as well as a course of individualized instruction with the Rabbi. Candidates' families must be KKBE members at the time a ceremony is scheduled, which typically is three years in advance of the Bar/Bat Mitzvah. Confirmation takes place at the end of the tenth grade. 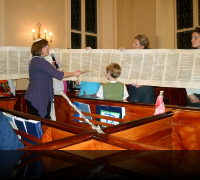 Confirmands meet regularly with the Rabbi to study what it means to be a modern Jew. Areas of study include theology, Reform Jewish philosophy, ancient and modern Jewish history. At the conclusion of the year, the confirmands lead the congregation in a service created in part by the class, thereby affirming their faith in Judaism. Jewish education is life-long and a valued aspect of congregational life. Adult programming includes Torah study, life-long learning on a wide variety of topics, an annual retreat, and other adult education classes.